"Texas Sheet Cake made with peanut butter instead of chocolate! 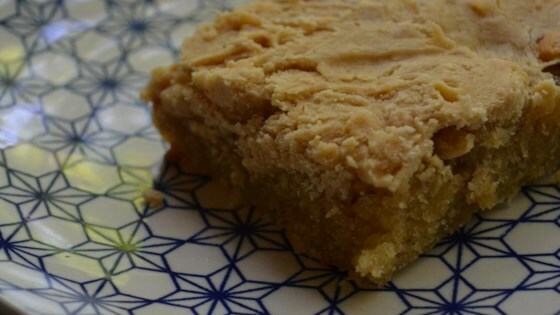 Wonderfully moist with a delicious peanut butter frosting!" Preheat the oven to 350 degrees F (175 degrees C). Grease a 10x15x1 inch jellyroll pan. In a large bowl, stir together the flour, 2 cups sugar, baking soda and salt. Set aside. Combine the water and 3/4 cup of butter in a saucepan, and bring to a boil. Remove from the heat and stir in 1/2 cup peanut butter and vegetable oil until well blended. Stir this mixture into the dry ingredients. Combine the eggs, buttermilk and vanilla; stir into the peanut butter mixture until well blended. Spread the batter evenly in the prepared pan. Bake for 18 to 26 minutes in the preheated oven, or until a toothpick inserted near the center comes out clean. While the cake bakes, place 2/3 cup sugar, evaporated milk, and butter in a saucepan. Bring to a boil, stirring constantly. Cook stirring for 2 minutes. Remove from heat and stir in the peanut butter, marshmallows and vanilla until marshmallows are melted and the mixture is smooth. Spoon the frosting over the warm cake and spread in an even layer. Allow to cool before cutting and serving. This cake is wonderful!!! Rich and moist and flavorful! I used two sticks of margarine instead of butter and oil and baked it in a 9x12 pan - came out LOVELY! Great with fudge frosting! This is a great cake. If you love peanut butter this one is perfect. I made it for work and it was gone by lunch and I made another one the same night because it is an easy cake.